Chakrabarti, Shubhra, and Patnaik, Utsa (eds.) (2017), Agrarian and Other Histories: Essays for Binay Bhushan Chaudhuri, Tulika Books, New Delhi, pp. xxiv + 328, Rs 995. 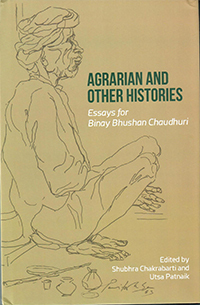 Professor Binay Bhushan Chaudhuri is one of the most distinguished historians of agrarian India and much gratitude is owed to the two editors to have compiled this volume of essays in his honour. We have here contributions from scholars who have themselves won eminence in the disciplines of economics and history. Before proceeding to consider articles in this volume that deal with or touch upon agrarian history, we need to recall how much Professor B. B. Chaudhuri’s two major works in this field, Growth of Commercial Agriculture in Bengal, 1757-1900 and Peasant History of Late Pre-Colonial and Colonial India, have contributed to its enrichment. Besides the two books, there are a number of important contributions to various journals and to the Cambridge Economic History of India, Volume II, to his credit. In considering the essays on agrarian history included in the volume, it is perhaps best to take them up by their themes in rough chronological order. This would require one to begin with Shinkichi Taniguchi’s article, “Rethinking the Bengal Peasantry in History” (pp. 41–64). Taniguchi argues that once settled agriculture began with the plough and wet-rice cultivation, an upper class among the peasants arose not simply as a result of economic causes, but also out of the functions of the established political structure. The effects of the rise of the market on this development often came later. In the late colonial period the increasing cost of reclamation, itself necessitated by an increase in population, required the intervention of an upper layer of “peasants,” possessed of sufficiently large resources to clear the land. These are matters of detail. The fact is that, apart from shifting cultivators, it is common to find “rich peasants” everywhere, for, as Marx noted, even if land is abundant, differentiation will arise on the basis of the varied number of cattle (and ploughs) that different peasants might possess. Datta also overlooks the factor of the drain of wealth. The figures he cites for bullion imports during the period 1796–1805 (p. 24) need to be contextualised. The 1790s were the years when there was an acute silver famine in Bengal, owing to large quantities of silver collected in revenue in Bengal, and exported to China to buy Chinese silk and tea for the Company. As much as 74.7 per cent of the Company’s revenue in Bengal, Bihar, and Orissa in 1796–97 was received in gold mohar owing to the scarcity of silver rupees (see Siddiqi 1981). The “drain of wealth” to Britain, which Rajat Datta dismisses as of little concern to Bengal’s economy, is of key importance for Utsa Patnaik, in the chapter “Revisiting the ‘Drain,’ or Transfers from India to Britain” (pp. 278–317). She calculates for us the astronomical figure of GBP 9,184 billion lost to England by India over the period 1765–1938, the bulk of it coming from the heavily taxed Indian peasantry. She is right in emphasising the fact that the extraction of tribute from India and other colonies, which Marx held to be a major source of the “primitive accumulation” of capital, has not received due attention in the West. As she says, there is a need for “a much greater degree of informed and honest scholarship in writing the history of the rise of industrial capitalism” that benefited from such accumulation (p. 312). Two local studies help us understand two exceptional local situations. David Ludden, in “Frontiers of Agrarian Bengal: Sylhet in the 1780s” (pp. 65–89), provides us with an admirably detailed study of the British territorial advance that accompanied agricultural expansion. The situation created the ground for small zamindars rather than the highly hierarchically structured large zamindaris in the interior of Bengal. Punjab, a land of low rainfall but large snow-fed rivers, was an ideal region for laying out canals, a task that the British undertook on a considerable scale in the latter half of the nineteenth century. Imran Ali has already provided us with a study of the “canal colonies” the British established in Punjab (Ali 1988). The experiment was unique in that systematic settlement was organised that combined official control with a reproduction of the established social hierarchy (care being taken, for example, to confine the “kamins,” or menials, to constricted quarters in a secluded corner of each settlement). Neeladri Bhattacharya studies the problems this combination created for the British authorities as well as for the canal “colonists” in a detailed chapter titled “Promise of Modernity, Antinomies of Development: Canal Colonies of Punjab (1890s–1940s)” (pp. 90–138). In the late nineteenth century the question of poverty, its character, and degree became an issue of acute debate between the nationalists and British officialdom. In “The Concept of Poverty in Colonial India” (pp. 267–76), Sabyasachi Bhattacharya recalls this debate and adds to it a fourth dimension, rather too briefly perhaps, of how the poor themselves assessed poverty. Can one hope that Professor Bhattacharya would expand the scope of his enquiry and give us a book on poverty in India, which around 1900, had perhaps reached its nadir? Finally, we have Professor Dietmar Rothermund&apos;s chapter “Emergence of the Peasant Landlord in India” (pp. 3–16). As always, what he writes has a refreshingly novel touch about it. One does not, for example, think often of the effect of laws of inheritance on the rural class structure. Rothermund’s argument is that free India promoted the interests of the upper layers of the peasantry, who already held land, usually as protected tenants of zamindars or as owners in their own right. Subsequent developments have only strengthened this class further. In the debates over the Green Revolution around 1970, this class was often called “kulak” and the process of their growth “kulakisation.” One would in general accept Rothermund’s thesis. But I have two qualifications to offer. First, the kulak is increasingly seen as the owner of a tractor and harvester, and not as a landowner. These machines, working on hire, have largely replaced the plough and the scythe of the peasant and the field labourer. Sometimes the rural entrepreneur also controls field irrigation with his tubewell. Land or moneylending, possibly the source of the original capital, might no longer remain the main source of income for such rural capitalists. The second reservation relates to certain general statements that Rothermund makes ex-cathedra. First, the statement that rich peasants would have supported pro-British parties rather than the Congress Party but for the Great Depression of the early 1930s, or that moneylenders supported the Congress in the 1936–37 elections. The contrary case can also be made. Peasant interests were opposed to those of the zamindars, who were the backbone of the pro-British parties, and the Depression did not change this political alignment. As for moneylending, the Congress, mindful of its peasant constituency, had promised, since the Karachi resolution of 1931, to scale down rural debt and control the usurers’ rate of interest. Some of these promises were fulfilled by anti-debt legislation under provincial governments formed by the Congress. This raises the question as to why moneylenders should have supported the Congress. Ali, Imran (1988), The Punjab Under Imperialism, 1885-1947, Princeton University Press, Princeton. Datta, Rajat (2000), Society, Economy and the Market: Commercialisation in Rural Bengal, c. 1760-1800, Manohar Publishers, New Delhi. Siddiqi, Asiya (1981), “Money and Prices in the Early Stages of Empire: India and Britain,” Indian Economic and Social History Review, vol. 18, nos. 3–4.